C&O Canal Dam No. 5 is located at canal mile 106. 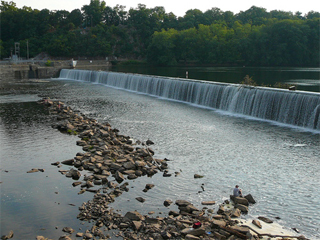 It is the fifth in a series of dams that supplied water to the C&O Canal. Dams No. 4 and 5 are owned by the National Park Service and leased to the Potomac Edison Electric Company, which uses them to generate electric power for Washington, D.C. Fishing is popular both above and below Dam No. 5. Nearby access is from the National Park Service ramp at Four Locks, about a mile upstream. The closest boat ramp downstream is at Williamsport, Md. On the West Virginia side of the river is the community of River Bend, which has a number of cottages with access to the river.